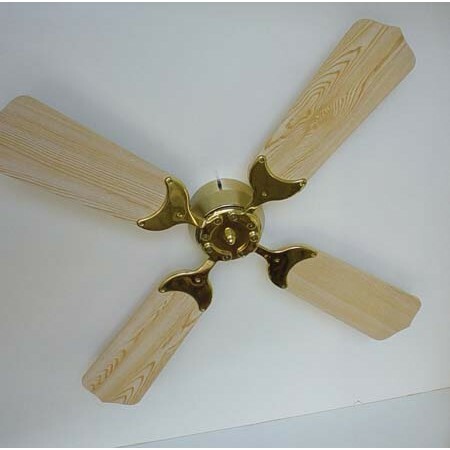 This is a 42" four-blade ceiling fan with light oak wood blades and a bright brass housing. Ideal for off-grid homes, RVs, etc. The 3-speed reversible motor is controlled by infrared remote control and draws 1.2 amps (on 12V models) at high speed, draws 0.75 amp at medium speed and draws 0.5 amps at low speed. This fan is designed for surface mounting on a flat ceiling. An 8" swivel pendant mount for pitched ceilings is available as an option. They are available for 12- or 24-volt DC operation. CSA approved.